From the River to the Sea...? The Republican National Committee (RNC) apparently supports a one-state solution in Israel/Palestine. Journalist Mitchell Plitnick reports that, last week in New Orleans, the RNC unanimously adopted a resolution calling for a single, unified state of Israel encompassing all the land of historic Palestine. BE IT FURTHER RESOLVED, that the members of this body support Israel in their natural and God-given right of self-governance and self-defense upon their own lands, recognizing that Israel is neither an attacking force nor an occupier of the lands of others; and that peace can be afforded the region only through a united Israel governed under one law for all people. Israelis behind the Green Line live under Israeli law. So do settlers. 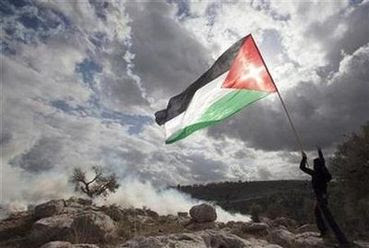 But Palestinians in the West Bank, including East Jerusalem are subject to a conglomeration of laws based on previous Jordanian law from before 1967, Israeli emergency laws and military regulations mostly adopted after 1967, and even some measure of old Ottoman laws, these particularly applied in East Jerusalem. So, there is no interpretation possible other than that the RNC is also advocating complete Israeli annexation of the West Bank, including granting citizenship to the Palestinians living there. I rather doubt that's what they intended, but that is what the resolution states. No doubt, the assembled delegates had no idea what they were advocating because they have no idea about the realities on the ground. "Israel can keep pillaging the West Bank as if it has been annexed, as if it and the West Bank are one undivided territory, it may go on transferring settlers to the West Bank, and at the same time deny the right of Palestinians to move outside their designated zones. "So, according to the High Court, what was once Mandatory Palestine is now inhabited by a religious group that has all the rights and by an ethnic group – which coincidentally, happens to be the indigent people – most of whose rights have been denied. So, next time someone asks you why you think Israel is an apartheid state, tell them the highest court in the land said so." RNC Distances Itself From Israel-Palestine One-State Resolution | After news broke that the Republican National Committee (RNC) passed a resolution at its winter meeting to seemingly abandon the two-state solution to the Israeli-Palestinian conflict, spokesman Sean Spicer distanced the group from the resolution. He told BuzzFeed the resolution, which passed unanimously, was a non-binding, symbolic act. He pointed to the Republican Party Platform as "the only thing that matters." The 2008 platform calls for a two-state solution to the conflict. BuzzFeed’s Ben Smith wrote that the resolution indicates a Republican grassroots support for "a far more maximal Israel position than that held by any but the most hawkish Israeli parties." The Palestinians can run their lives freely in the framework of self-rule, but not as an independent and sovereign state. Thus, for example, in matters of foreign affairs, security, immigration and ecology, their activity shall be limited in accordance with imperatives of Israel's existence, security and national needs. Jerusalem is the eternal, united capital of the State of Israel and only of Israel. The government will flatly reject Palestinian proposals to divide Jerusalem...The government firmly rejects attempts of various sources in the world, some anti-Semitic in origin, to question Jerusalem's status as Israel's capital, and the 3,000-year-old special connection between the Jewish people and its capital. Incidentally, both human history and Theodor Herzl, the founder of political Zionism, disagree with Netanyahu's Party's stance on Jerusalem. Likud also holds that "the Jordan Valley and the territories that dominate it shall be under Israeli sovereignty. The Jordan river will be the permanent eastern border of the State of Israel," and has promised to "extend Israeli law, jurisdiction and administration over the Golan Heights, thus establishing Israeli sovereignty over the area" and to "continue to strengthen Jewish settlement on the Golan." The RNC clearly favors all of the above prescriptions for Palestine, as evidenced in its unanimous resolution vote and in the campaign rhetoric of leading GOP candidates. How does their distancing themselves from their own resolution - and therefore from the Likud charter - sit with Netanyahu, the Prime Minister of the U.S. Congress? UPDATE: It should be noted that the language used in the RNC resolution is identical to comments often made by Netanyahu himself, especially regarding the Biblical claim ("God-given right") to the land of Palestine and the protestations that Jews everywhere are the direct descendents of the ancient Hebrews and therefore West Bank settlers should not be considered immigrants, colonists or occupiers ("Israel is neither an attacking force nor an occupier of the lands of others"). I recognize that in a genuine peace, we'll be required to give up parts of the ancestral Jewish homeland. And you have to understand this: In Judea and Samaria, the Jewish people are not foreign occupiers. We're not the British in India. We're not the Belgians in the Congo. This is the land of our forefathers, the land of Israel, to which Abraham brought the idea of one God, where David set out to confront Goliath, and where Isaiah saw a vision of eternal peace. No distortion of history -- and boy, am I reading a lot of distortions of history lately, old and new -- no distortion of history could deny the 4,000-year-old bond between the Jewish people and the Jewish land. You hear http://www.blogger.com/img/blank.gifthat? Jewish land. In his speech, Netanyahu stated, "The Palestinians share this small land with us. We seek a peace in which they'll be neither Israel's subjects nor its citizens. They should enjoy a national life of dignity as a free, viable and independent people living in their own state," and later added, "I want to be very clear on this point: Israel will be generous on the size of a Palestinian state, but we'll be very firm on where we put the border with it."